Mgr Basil Loftus in The Catholic Times 6th March 2015. The key phrase is ‘theological knowledge’. As any child in a catechism class will (or should) tell you, Scripture and Tradition are the sole sources of the teaching of the Church, that is, of dogma. They convey to us the Deposit of Faith, given to the Church by God, to which nothing can be added or taken away. To avoid the impression that he is contradicting this truism, Loftus talks about ‘theological knowledge’ instead of dogma. Oh yes, he is well aware of the traditional formulas and always goes to the trouble of throwing some sand in his readers' eyes when he wants to contradict them. What is theological knowledge? He doesn't say. Where can it come from, if not from Scripture and Tradition? It appears to come from experience. What kind of experience does he mean? The wonderful, and somewhat old-fashioned, phrase 'experimental theology' is theology based on experience: it is experiential theology. You might think this had something to do with religious experiences, but it isn't the experiences of people growing in holiness in which Loftus is interested - quite the opposite. The way he would describe it, I imagine, would be in terms of 'Reason', using another phrase of (some of) our separated brethren, which adds 'reason' to 'scripture' and 'tradition' as a source for theology. That's not how we express it. In the Catholic Church there is, of course, such a thing as the results of the Natural Light of Reason, which is to say (in modern terminology) of empirical reflection without reference to Revelation. We call it ‘Natural Theology’, and it can also give us a certain amount of ‘Natural Law’, which is written on our hearts. So reason tells us, for example, that there is one God, and that murder is wrong. It would be peculiar, however, to call this ‘theological knowledge’, because the whole point of theology is that it does use Revelation. Philosophy, in the traditional conception of things, explores what is available without Revelation, and it produces philosophical knowledge (if it produces any knowledge at all). Revelation and Reason are two sources of knowledge: that much is true. Unless Reason is in error, or Revelation is being misunderstood, they cannot conflict. Revelation clarifies and corrects the moral principles and speculations about the divine origin of the Universe discovered by Reason alone. But this is no use to Loftus. He wants to make use of experience, ‘lived experience’ if you prefer, to clarify and correct what has been revealed to us by God, and taught by the Church for two millennia, not the other way round, and in any case he isn't interested in the observations of Natural Law. The Natural Law written on our hearts, the law which can be perceived at work in human relationships, tells us that marriage is a life-long commitment ordered to children. The natural institution of marriage and the customs surrounding it confirm this; societies in which these rules are violated demonstrate it even more convincingly, in the human misery which these violations create. When spouses are allowed to divorce at will and remarry, for example, we see the breakup of the stable homes needed by children, and every permutation of exploitation. All this natural, rational, philosophical knowledge, moreover, is clarified and corrected by Revelation, when Scripture and Tradition tell us of the indissolubility of marriage. What Loftus would like to see is our experience of people wanting to divorce at will, for any and every reason, of people wanting to live in sin, wanting to ignore the interests of their children, and wanting to exploit their partners sexually or financially, as a corrective to the teaching on the indissolubility of marriage. Our desires, the idea is, should be taken into account. That is what he means by 'experience': not the melancholy experience we've all had, second hand if not first hand, of the horrors unleashed by divorce, not the experience of happiness and stability of those who maintain their marriages or grow up in families which have not been torn apart - no, all that is irrelevant - but the temptation to sin. If we are tempted to sin, the suggestion appears to be, that must mean that it is 'natural', 'reasonable', and isn't a sin. 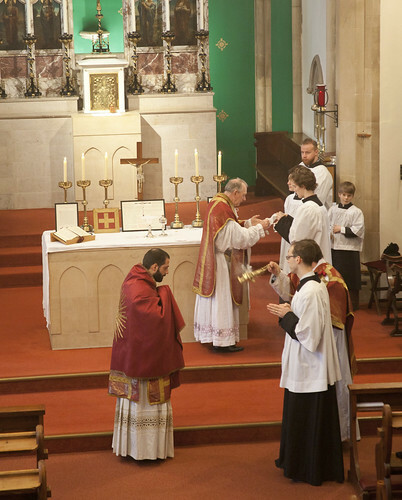 The celebrant washes his hands while the subdeacon is incensed by the deacon. The liberals would resist this conclusion were it applied to any other area of life, but in the case of marriage they embrace it. The reality is that they have a big problem with the concept of Original Sin; Loftus has in fact delivered himself of some very weird interpretations of that doctrine in his column in the past. Original Sin is the explanation of why our natural appetites don't always coincide with the right thing to do, and also why our attempts to find the truth about morality and the origin of the universe by natural reason alone have, in practice, to be corrected by Revelation. It is important to keep this in mind: it a denial of Original Sin which is at the heart of the problem; the doctrine of the Immaculate Conception of Our Lady, her preservation from Original Sin, which throws the teaching on Original Sin into sharp relief, also comes under ceaseless attack from liberals for the same reason. Gaude, Maria Virgo, cunctas haereses tu sola intermisti in universo mundo! Rejoice, O Virgin Mary, thou hast destroyed all the heresies of the whole world! As a service to the public, I have put together quotations on a range of themes from Loftus' published writings, mostly his Catholic Times columns, in a dossier here, and made one of his most theologically egregious articles articles, on the Resurrection of Our Lord, available here. If I recall correctly, wasn't the use of "experience" as a source of theological knowledge one of the errors of the modernists condemned by Pope St Pius X in Pascendi Dominici Gregis? 15. "But this doctrine of experience is also under another aspect entirely contrary to Catholic truth. It is extended and applied to tradition, as hitherto understood by the Church, and destroys it. 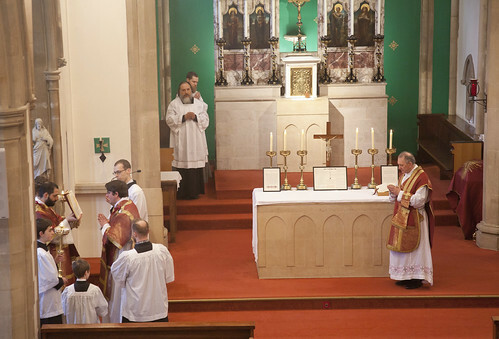 By the Modernists, tradition is understood as a communication to others, through preaching by means of the intellectual formula, of an original experience. To this formula, in addition to its representative value, they attribute a species of suggestive efficacy which acts both in the person who believes, to stimulate the religious sentiment should it happen to have grown sluggish and to renew the experience once acquired, and in those who do not yet believe, to awake for the first time the religious sentiment in them and to produce the experience. In this way is religious experience propagated among the peoples; and not merely among contemporaries by preaching, but among future generations both by books and by oral transmission from one to another. Sometimes this communication of religious experience takes root and thrives, at other times it withers at once and dies. For the Modernists, to live is a proof of truth, since for them life and truth are one and the same thing. Hence again it is given to us to infer that all existing religions are equally true, for otherwise they would not live." But I think Loftus is worse. The Modernists were appealing to a sense of the divine. Loftus is appealing to a sense of the libido. I would certainly agree that Loftus is worse. He is following the same line as the German bishops in extrapolating modernism to its ultimate conclusion: sin exists as part of human experience; sin is therefore good; the doctrine of the Church must therefore develop to accept sin.